An İstanbul court on Monday evening ruled for continuation of imprisonmenet of five Cumhuriyet daily journalists — Akın Atalay, Murat Sabuncu, Kadri Gürsel, Ahmet Şık and Kemal Aydoğdu. 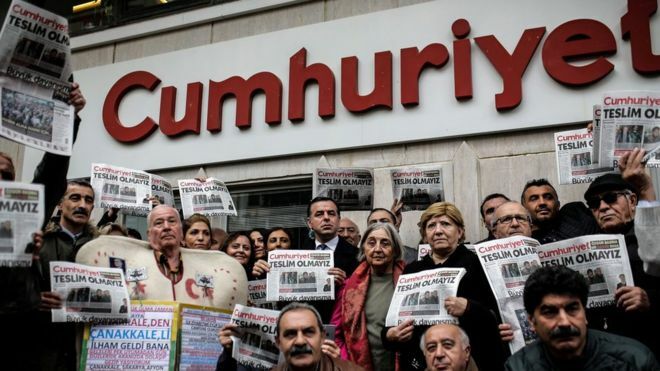 According to Turkish media, İstanbul 27th High Criminal Court ruled on Monday that the five Cumhuriyet journalists will remain in pretrial detention until the next hearing on Sept. 25. The charges brought against the suspects in an April indictment accuse them of aiding the PKK, the DHKP/C and the Gülen movement which is accused by Turkish authorities of being behind a failed coup last year. The suspects were arrested by the İstanbul 9th Penal Court of Peace on Nov. 5, 2016. Atalay was detained at İstanbul Atatürk Airport upon his return from Germany and subsequently arrested on Nov. 12, 2016. Cumhuriyet reporter Şık was also detained on Dec. 22 and arrested on Dec. 30, 2016 on charges of disseminating terrorist propaganda.